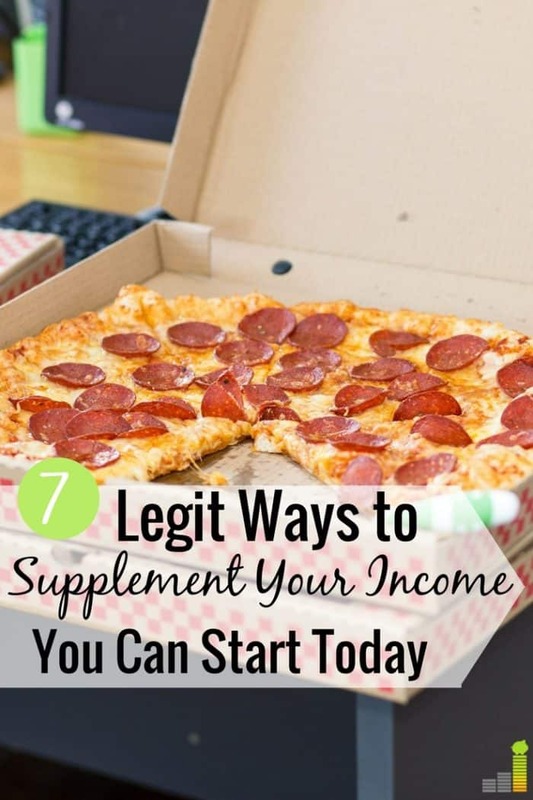 7 Legit Ways to Supplement Income: You Can Make Extra Money Today! One of the best opportunities to change your financial situation is to find ways to supplement income. Whether you’re trying to pay off debt, save more money for retirement, or save for your next vacation, supplementing your income gives you the power to reach those goals. When you need to supplement your income, you have to be strategic and use your time wisely. Not every money making opportunity is worth the time and effort required to make additional cash. Working a minimum wage job isn’t going to earn you a significant amount of income fast. If you need to make extra money today, this post will help you find ways to supplement income and improve your financial life. Many people believe it’s difficult to make extra money. It’s common to think you need specialized skills to earn extra cash, so many hold themselves back from pursuing supplemental income. Don’t let that fear hold you back! There are plenty of ways to supplement your income you can try today. Often, the simplest way is to ask for a raise at your full-time job. The worst your boss can say is “no” but they might say “yes.” When asking for a raise, make sure you have a good argument and examples for why you think you deserve it. You want to show your quantifiable value to your team. Asking for a raise is not the only way to make extra income, it’s just the tip of the iceberg. Here are seven legit ways you can supplement income, most of which you can start today. Driving for a ridesharing service like Lyft is a great way to supplement your income and it requires no specialized skill. If you like meeting new people and want the flexibility of creating your own schedule, this can be a good way to make extra money on the side. You might also need newer car but that depends on your city and state’s requirements. Lyft is currently offering a $250 sign-on bonus for new drivers. If you have free time on evenings or weekends, driving for a rideshare service is a good way to bring in some additional income. Babysitting is one of the most traditional ways to supplement your income. It’s not often you can find a side job that pays well above minimum wage and babysitting does. If this sounds like a good option for you, getting certified in CPR or completing coursework means you can ask for a higher hourly rate, too. Last week, I hired a college student to watch my son for a few hours in the morning while my husband and I took our daughter to the hospital have her tonsils removed. He arrived at my house at 6:30 in the morning and played with my son, watched TV, and in general had a good time. When he left, we owed him $50. That’s a large amount of money to earn before 11:00 AM if you’re only 18 years old. Getting referrals is a great way to earn more money as a babysitter. You can ask clients for other families they might know who have a need. You can also use a service like Care.com that lets you set up a profile, find clients, and get reviews from previous clients. How much time do you spend watching TV at night? Maybe you spend a lot of time on the train or bus to work. You can use that down time to supplement your income. The best way to do that is through taking surveys online. Surveys will not replace your income but they can be a good way to make money in your spare time. Supplemental income is great but if you can find a way to make passive income (income that requires little work), that’s even better. One of the best passive income ideas is real estate. You might think you can’t afford to invest in real estate. Even if you can’t invest in real estate, the house you’re living in right now provides one of the best ways to supplement income. You can rent out a room, or even your house if you travel frequently, through Airbnb to make extra money. According to Priceonomics, people renting properties through Airbnb earn an average of $900 per month. Your income will vary but it may be worth pursuing if you have a spare room. Remember there will be upkeep and to check with your landlord if you rent or homeowners association and homeowners insurance if you own your home. Assuming you can, renting your property can be a great way to create residual income with little effort. How much clutter and old electronics do you have sitting around your house? If you have items you no longer use, you can sell those items to bring in supplemental income. Like online surveys, this won’t make you rich but it can be a nice way to bring in several hundred dollars, or more, depending on the items you’re selling. You can sell larger items through craigslist or your local Facebook marketplace. Each site has their own requirements so make sure to compare them before selling as you might get more from one service than another. The food industry is a tough industry to be in but the best part about it is the tips. If you are an exceptional waiter or waitress, you can earn far more than minimum wage every hour. You can even work at Starbucks starting at 5:00 in the morning. My husband used to do that and the tips left in the tip jar enabled him to earn $11 or $12 an hour instead of $8. Dave Ramsey, the popular financial expert, always recommends delivering pizzas as one of the top side hustles. He recommends this to supplement your income because you can do it in the evenings after work and pocket any tips you earn along the way. Another option for delivering food is Uber Eats, and they give you the freedom to deliver food from multiple restaurants. Is delivering meals or working in a restaurant on the side easy? No. However, it’s a good short-term way to supplement income. This is the route I took when I wanted to supplement my income. I started as a freelance writer making only a few dollars a post and eventually, I left my 9-5 job teaching at a university to write full-time. Along the way, I also grew my personal blog to produce an income which also helped supplement my income. Keep in mind that growing an income-generating blog takes a long time but if you are a graphic designer, writer, coder, or copywriter, you can start earning money immediately. If you want to start a blog, check out our guide on how to start a blog. To find work, search job forums and on places like Upwork. You can also start by posting the work you’re offering on your Facebook page just to see if anyone needs help with tasks like building a website or creating a new business logo. Starting an online business is probably the most lucrative way to supplement your income you’ll find on this list. However, it is also the most time intensive. You have to be persistent when it comes to finding work, generating leads, and seeking out the best clients. If you want to supplement your income, try finding work that pays well above minimum wage. You want to maximize your time and make every hour count so that you can reach your financial goals. What have you done to supplement income on the side? Are there some residual income ideas you’ve seen be successful? What excuses have you heard from others as to why they can’t make extra income? The post 7 Legit Ways to Supplement Income: You Can Make Extra Money Today! appeared first on Frugal Rules.